The process for this award winning design started with the owner asking me to convert their dilapidated steel shed into a small temporary residence until he raised enough money to do a brand new house in a separate location. The owners of this house required extra space on the main floor level for living areas which intially had a small kitchen, dining, living and powder room but was also containing the main bedroom, ensuite and robe. To design and construct a home that showcases my design style and reflects what I’m capable of to our clients. 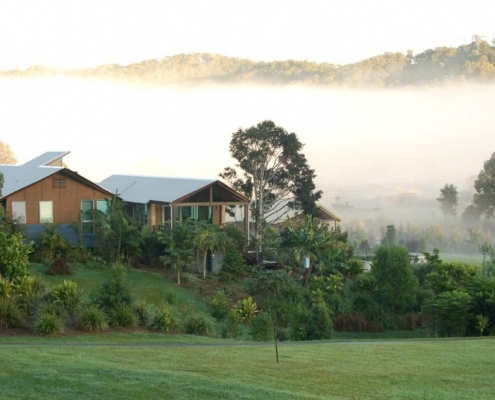 Our home is located in the multi award winning “ Ecovillage” in Currumbin Valley. 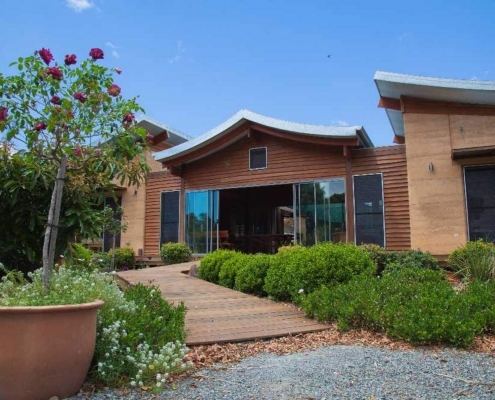 The Ecovillage is Australia’s Best Sustainable Development having won over 25 Industry and Government Awards and recently awarded the International Real Estate Federation’s highest award the Prix d’Excellence. 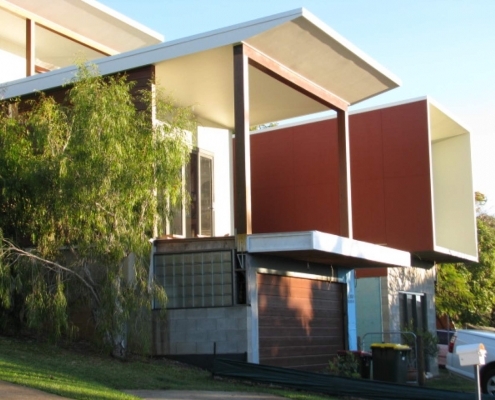 The existing residence consisted of a 1970’s, 2 storey fibro residence with closer than the usual council setbacks which is common amongst older homes in the area. We decided it would be best to renovate rather than detonate so that we could keep those setbacks and also allow for sustainability, recycling all the usable materials. 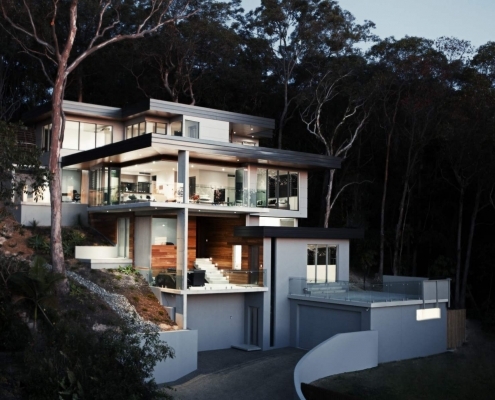 This contemporary style multi level home is nestled into the side of a very steep hill. 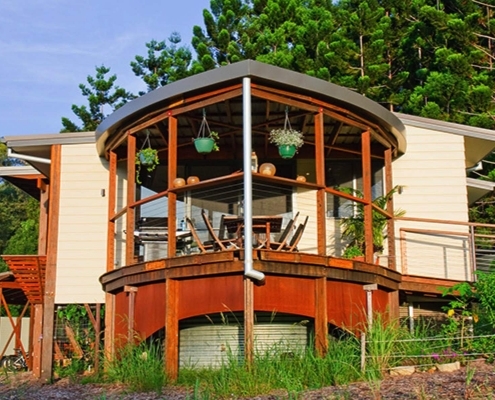 So close to the beach to be an easy stroll yet surrounded by bush and in total privacy. Constructed largely of insitu concrete and glass offset with highlights of hardwood chamferboard to provide warmth and tie the building in with it's natural surroundings. 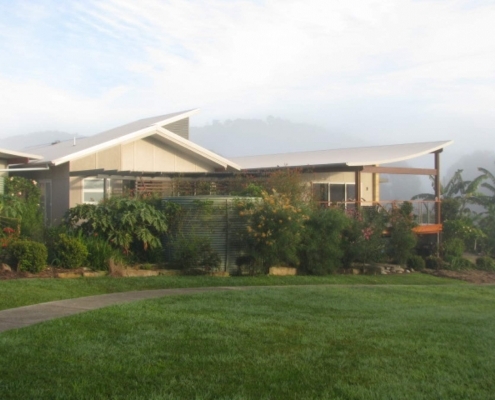 This multi award winning home was designed for 3 generations of the one family to all be able to live together. 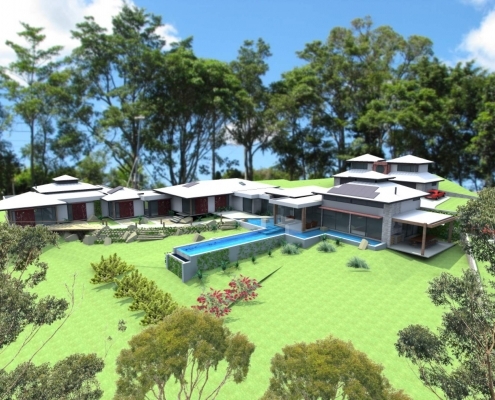 Set high on gently sloping hill overlooking the Gold Coast from Surfers to Fingal and Cook Island, it needed to be open to the views yet still maintain privacy between the families. They wanted pavilion style pyramid roofs and for this reason I felt resort style would be a suitable solution. 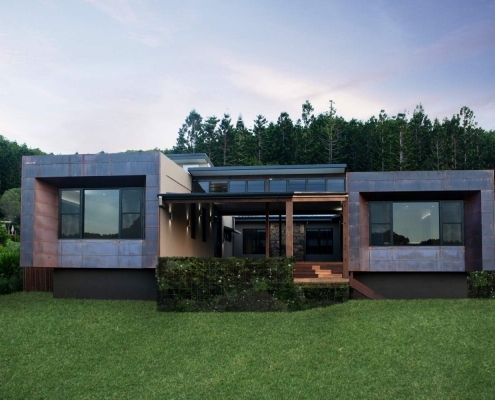 Copper cladding to the front facade sets this home apart from the rest. As this house had no overhangs to protect the walls, copper was a low maintenance choice that will handle the weather for another 200 or more years without requiring painting or any maintenance. 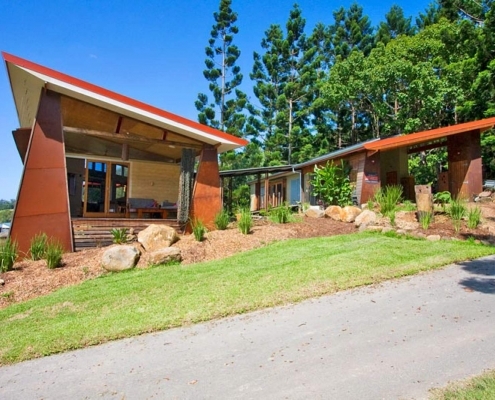 The clients and owners Landmatters Pty Ltd, developers of “The Ecovillage” in Currumbin Valley, wanted an exemplary residence that showcases World’s Best Practice in sustainable design and living, and create Australia’s most sustainable residence. 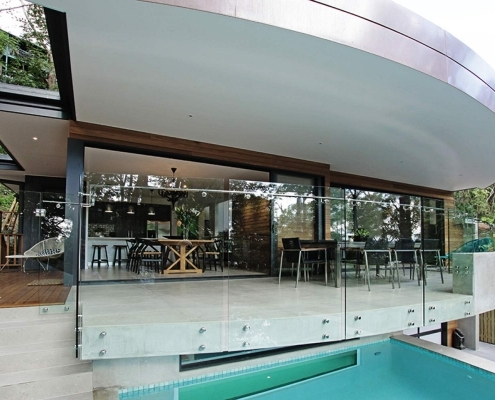 A co-operative design effort resulted in a multi award winning and much published home. 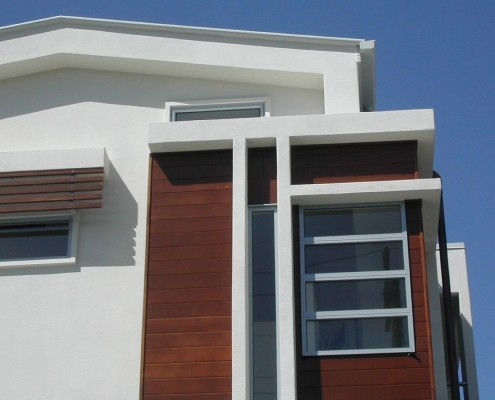 I designed this home with 2 balconies - a public balcony in the shape of the bow of a ship, complete with gangplank and anchor, the lower portion of steel in the shape of a bow wave. The other a private balcony with in built bench seats creates a resort style atmosphere. 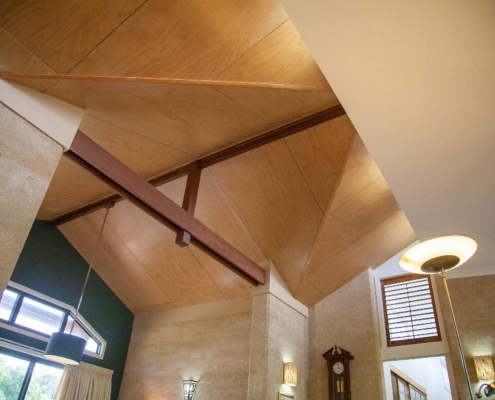 The main “Engine room” of this house is a wall of rammed earth down the spine of the ship which is warmed by highlight louvre windows. This design was a team effort with well known Landscape Design and Construct team "Eco Garden Shop". As such their home needed to relate well to the garden and to reflect their life's work. 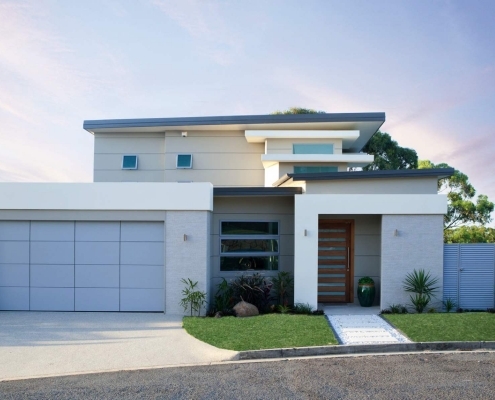 A good building designer always designs a home with the garden form and function in mind and a good Landscape designer always designs a garden with the views and function of the house in mind. The owners wanted gables to the front of their home. Not being happy with just a standard gable I designed cantilevered curved roof iron to the gable ends adding an organic touch. Backed up with chunky recycled hwd feature work and touches of copper for durability. 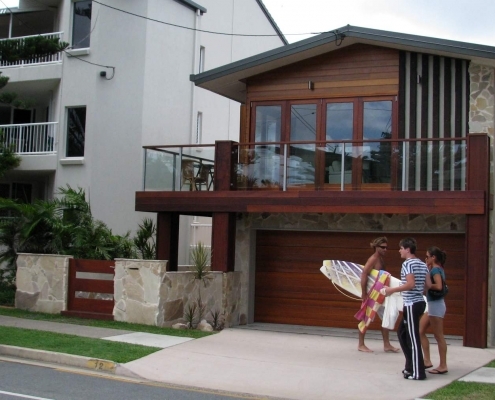 Beach side of the highway near Currumbin Bird Sanctuary, this was an old fibro house with a small one bed apartment. 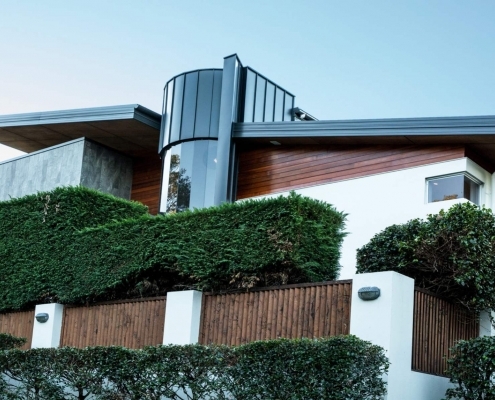 The owners wanted to make the most of their site and renovate it into a modern duplex. The flat was demolished and replaced with a 3 storey townhouse duplex to make the most of a limited site. 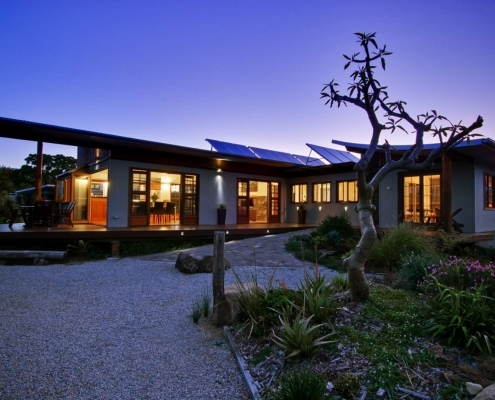 This home has a polished concrete floor combined with rammed earth blade walls for it’s thermal mass heating system. Recycled hardwood decks are curved to carry on the organic feel to the home. 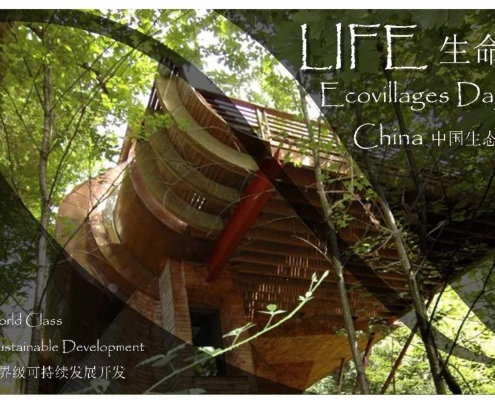 Here are some samples of a presentation to Chinese diplomats in Dayi. I was part of the design team led by the Late Chris Walton along with Gerard McCormick from Cardno's to design 2 large Ecovillages and a high tech sustainable industrial park. The bid was successful securing the client access to hundreds of acres of prime development land. A simple structure of recycled hardwood post and rail system bolted to a recycled steel sub-floor structure. I designed two ultra thin gently sloping Ritek skillion roofs over the structure to achieve that floating sensation. 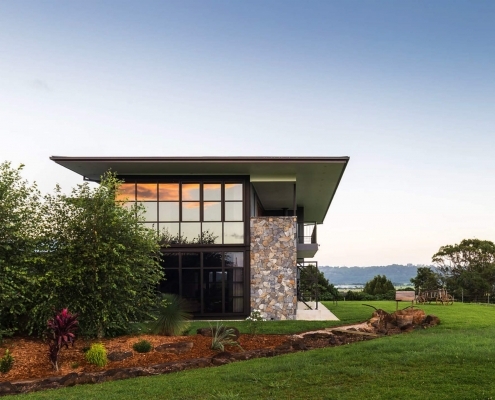 Bi-fold timber and glass doors combined with louvre windows opens the house up to magnificent ocean and valley views. 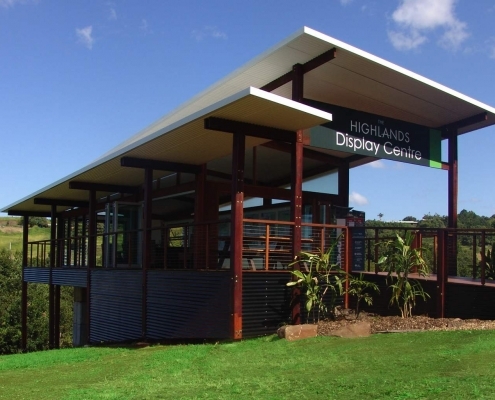 A plain back wall to the south for architects display purposes doesn’t block the ventilation or light due to low level awning windows and high level polycarbonate.